Baker Perkins' process innovation and production expertise for the confectionery, snack, cereal, bread and biscuit industries were emphasised at Sweet and Snack Tec India in New Delhi in September. 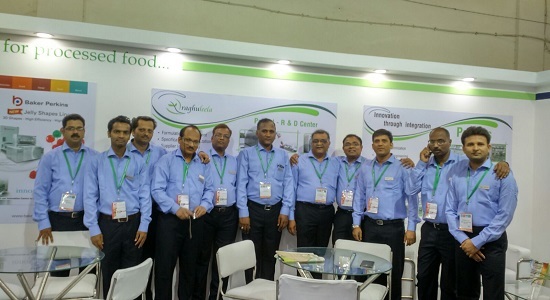 Baker Perkins were represented on the stand of our agent, TriplePee Solutions (www.3psolutions.in). In the confectionery industry, Baker Perkins depositors are used extensively for hard candies, lollipops, toffees, caramels, jellies, fudge and fondant; these systems are well established in the Indian confectionery industry. High output and high efficiency with low production costs and hygienic operation are the main benefits that depositing brings to these sectors compared to conventional methods such as die forming, starch mogul or cut-and-wrap. Jellies are a growth product in the Indian market, particularly 3D shaped products. There is also a rapidly developing market for functional jellies carrying essential nutrients such as vitamins, minerals, fibre and protein or beneficial supplements such as folic acid and Omega-3. Depositing into solid moulds produces single-, multi-coloured or filled jellies with excellent dimensional and weight accuracy as well as a smooth surface finish. Minimal waste, automatic operation, and easy maintenance keep operating costs very low while the hygienic design and rapid cleaning ensure that the highest standards of food safety can be met. Twin-screw extrusion technology is at the heart of versatile systems producing a wide range of high-quality snacks and ready-to-eat cereals. A standard system is a flexible way to enter a market at a low capital cost; extrusion systems can be expanded as a business grows and more complex products, or even a completely different product range, are required. Standard systems produce direct expanded, shaped products. Adding co-extrusion capacity increases the scope for innovative product development; this technique involves extruding a hollow tube of cereal while simultaneously injecting a low-moisture cream or paste filling into the centre. The flexibility of the extrusion process has created a widening catalogue of products. In the snack sector the variety includes shaped, filled, premium and healthy possibilities. Every kind of traditional breakfast cereal can be produced, included flaked and shredded varieties. Consumption of western-style bread is growing in Asia. Mixing and forming systems from Baker Perkins enable high-output plant bakeries to meet this increasing demand. A new Tweedy™ dough mixer and upgraded Accurist 2.1™ divider retain all the process characteristics of their proven predecessors, but have been developed to improve operation, cleaning and maintenance. The complete fully-integrated Tweedy™ dough mixing system is automated from ingredient weighing to dough delivery to the divider, virtually eliminating routine operator intervention and inconsistency. At the forming stage, the Baker Perkins Accurist2.1™ divider, conical rounder and Multitex4™ moulder minimise stress and damage to the dough through gentle handling. The integrity of the dough structure is preserved, giving a loaf with higher value and consumer appeal. There is an increase in loaf volume, better colour, increased resilience and greater softness. A new biscuit baking oven bringing improvements in efficiency, hygiene and quality of manufacture has been introduced by Baker Perkins. The TruBake™ is the latest generation of Baker Perkins direct convection oven, based on technology proven worldwide and baking every type of biscuit, cookie and cracker. Efficiency is enhanced by re-engineering the burner and fan module to create a laminar flow of air over the full width of the burner. This continues into the ducts and plenums and leads to a stable and even distribution of convection air over the full width and length of the oven band. The result is precise, consistent and predictable baking. Baker Perkins customers take advantage of the widest available range of equipment to produce biscuits, cookies and crackers. Baker Perkins delivers complete, automatic production plants that include mixing, dough forming, baking and cream sandwiching technology; they harness the latest engineering and control expertise to maximise performance while making machines easier to operate, maintain and clean.